Pretty much everything is finished over at the flip – we just need to have carpet installed in 3 bedrooms, paint touched up throughout the entire house, and I need to get my rear in gear and plant some flowers in the front beds. SO CLOSE! Our plan is to get the house cleaned up early next week, then stage it (it’s been awhile since we did that!) and have it photographed and ready to be listed by the end of the week. Fingers crossed everything goes according to plan! Wow! Love it, and we got a 2 for 1 with house AND baby pictures! 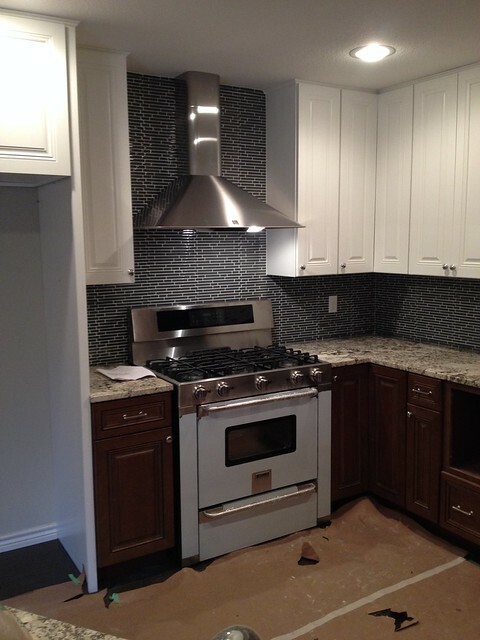 The kitchen tile looks fabulous! How fun would it be to take a shower with ALL those sprayers!?! Great job, Liz. Such a cute baby girl! I just found your blog and am impressed by how many houses you’ve flipped. My husband and I just getting started designing & building our own home, so looking at all of your ideas is super fun! Love the kitchen, with the wood/white cabinets! Also, is the backsplash black or navy? All of it is absolutely gorgeous!!! It’s actually a dark gray! It’s kind of a chameleon in the lighting – I’ll post a better pic of it soon. Thanks for the reply! I too am in North Dallas, and I absolutely LOVE all of your flips, just wish I could figure out where they are at, I have a hunch but anywho keep up the great work!!! Eeek! This looks SOOOO good. I love the stove. And the cabinetry. And the tile. Okay. I love it all. Looks like you have done some fantastic work! Well done! I’m a builder from the UK and as well as my job my wife and I have renovated 5 houses. Currently we are living in the most recent one and we have no plans to move again! Do you think you will attempt another? You wash room looks so amazing. Wow it has really come together. Nice work!